No one knows more about using the new Real-Time tools and strategies to spread ideas, influence minds and build business than David Meerman Scott. He's a marketing strategist, speaker, advisor to emerging companies, and author of ten books including three international bestsellers. 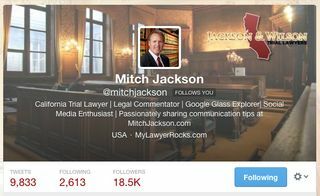 Mitch Jackson is a senior partner in the California law firm Jackson & Wilson with the fantastic pointer URL MyLawyerRocks.com. Jackson & Wilson are an established firm, with local lawyers, judges, and past clients frequently referring cases to them. Even though they have plenty of business, Mitch writes a blog where he comments on the legal aspects of stories in the news and shares via social networks. And he gets tons of attention as a result. His popularity has resulted in more than 18,000 followers of his @MitchJackson Twitter feed. For example his post Michael Sam is Gay and the NFL Team That Drafts Him Will Face Major Litigation Exposure resulted just a few hours later in being invited to appear on a Fox Sports show with @Seth_Everett to talk about the NFL and Michael Sam. Did I mention Mitch is a lawyer? Many people tell me that the ideas I discuss like real-time marketing and newsjacking aren't for them. They say their business is different. Mitch’s post Who Is Responsible for the Death of Philip Seymour Hoffman? was written soon after the death was reported and gave people a different way of looking at the sad story. What Will Happen Next in the Amanda Knox Murder Case? Thanks for sharing with us Mitch. Keep up the great work. When the News Media Wants Your Content Right Now!